Just 3km from Bovec in the charming, peaceful, alpine village of Cezsoca, Lepa Soca House is a beautifully decorated, contemporary and comfortable holiday property on two levels with foot access to the stunning Soča River and a number of lovely local river beaches, kayak centre and riverside walking / biking trails. Local restaurants and shops are also in walking distance and furthers amenities are just a few minutes away by car in Bovec. 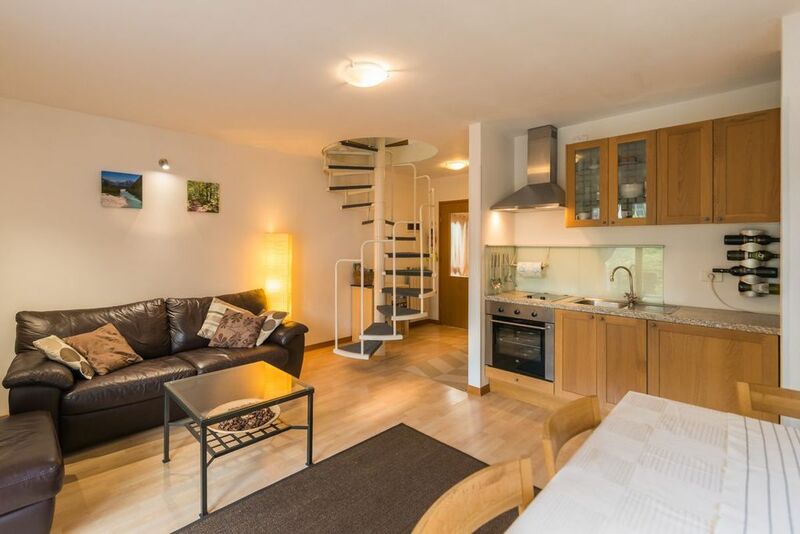 The property features an entry room, bathroom, open plan living room with double sofabed, kitchen & dining room with access onto a balcony with comfortable seating. Upstairs are two comfortable bedrooms under the eaves with great views of surrounding mountains. There is also an attractive private garden to the rear of the house. A huge range of outdoor activities such as walking and cycling are possible from your doorstep as well as a wide range of river pursuits (kayaking, rafting, world class fly fishing & canyoning) and mountain sports in easy reach (skiing at Kanin just five minutes drive). Facilities in the apartment include large flatscreen TV & DVD player. Tourist tax is calculated based on valid regulations at the time of booking. If local regulations on tourist tax change between booking and arrival, the amount which is correct at the time of arrival will be chargeable. We (2 parents and kids of 16-14-11 years old) were positive surprised of the appartment where everything you need was included (it is not everywhere we find DVD for the rainy days). We hoped just a bit larger terras, but in the garden it was also ok! Just the bed / couch in the living was ... like the environnement with montains and up and down . The village also perfect with a little shop where we can get everything we wanted, and the little restaurant just behind the house. We 've enjoy our passed week! Perfect base for an active family vacation! Exactly the apartment we wanted for our family vacation with three kids. Some nice surprises such as a selection of DVDs for lazy days - especially the Narnia movie partially shot in the same valley! Customer service by the owner was excellent, there's a nice restaurant just around the corner and a selection of restaurants, several stores and activities in Bovec just a couple of kilometers away. And the whole valley with Soca river was stunningly beautiful! We'd recommend for anyone looking for an active vacation - biking, rafting, paddling, trekking, etc. If you arrive late (after dark) from Ljubljana airport, consider taking the slightly longer route and arriving to Bovec via Italy. The shortest way over the mountain road is amazing in daylight but with all the tight turns it's slower, at least in the dark. One note: The stairs leading to second floor/bedrooms are very steep - if you have toddlers you'll have to keep an eye on them! This two storey house was very comfortable and had everything we needed as a couple. The lively town of Bovec is a few minutes' drive away and is excellent for shops, restaurants, activities etc. The Soca river and its surroundings are stunning and great for exploring, particularly on foot or by bike. The village of Cezsoca is in a great setting. At the weekend in particular it is a popular base for those coming for rafting and other water activities. The service and support from Think Slovenia was excellent throughout. We, a family of 4 with 2 teenage children, stayed in this apartment from June 1st to 11th 2009, a very pleasant experience. Although I was worried about booking over the web, everything went according to plan and the apartment was exactly as it appeaed on the web, only better. It was relatively new, spotless and although compact, had everything we needed. The owners had very throughtfully provided a number of extras which made a big difference - a range of DVDs, music, books, games which really helped to keep us occupied on the wet days, of which there were several. Loved the quiet village location, the fantastic river Soca nearby and really enjoyded the atmosphere in the nearby town of Bovec. Did a range of activities - kayaking, canyoning, cycling. Canyoning not to be missed! ...for a very nice introduction to Slovenia. The welcoming book & other touristical materials made it easy to decide for our first trips out - we have had a very nice week in Cezsoca & Bovec and your apartment have been a perfect place to do excoursions from! We have been hiking a handfull of beautifull routes, seen the spectacular caves of Postojna, toe-dipping Soca 8°C, eating well & pleanty of cheap! ice-cream in Bovec. We have had a brilliant holiday here. The apartment is lovely, so comfortable and well equipped. The games, magazines, books, CDs & DVDs make it feel very homely and luxurious! Cezsoca & Bovec are lovely, we're really glad we chose here as our base. We've been to Bled. walking in Triglav National Park, to Juliana Alpine garden, rafting and swimming in the Soca, up Mangart mountain and so on! It's been beautiful and peaceful (though perhaps too hot some days!). Hopefully we'll come back here for another holiday. 40% deposit payable on reservation, 60% payable 1 month before arrival. Cancellation: To keep prices low we offer fixed, non-refundable bookings, with cancellation protection insurance available on request at 5% of the cost of your stay. Refunds can be offered if we find replacement guests for the same period that you cancel. A refundable security deposit of 200EUR is payable for this property, taken by credit / debit card preauthorisation, unless agreed otherwise. Your booking at Lepa Soca House (Address: Cezsoca 35b, 5320 Bovec, Cezsoca) is made via Think Slovenia on behalf of the owner Carl Seve, sobodajalec.